After tweeting a short cryptic teaser that had the Bassnectar family clamoring over possible upcoming events, Bassnectar has officially revealed his return to Chicago, IL, March 30–31, 2018, after a seven year Windy City hiatus. The two-night run features an incredibly diverse cast of bass music’s most promising rising talent, including REZZ, TroyBoi, TOKiMONSTA, Ivy Lab, Danny Corn, and Bay Area newcomer Andreilien. 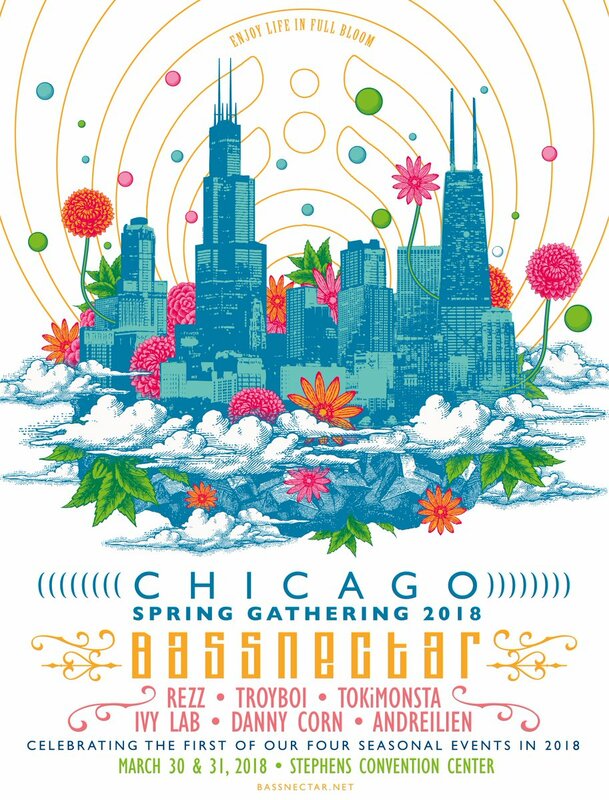 The theme of the spring time gathering, according to Bassnectar’s official blog, is set to “…celebrate the dawning of Spring: rebirth, regeneration, and a radiant gratitude for life.” The whole team promises to amp up all levels of art, music, interactivity, and community as well with staples like The Haven and The Gift Altar. Pre-sale tickets for the Spring special event will go on sale Wednesday, November 15th at 12pm ET. Regular tickets will go on sale the following day, also at 12pm ET. Read the full announcement on Bassnectar’s official blog.